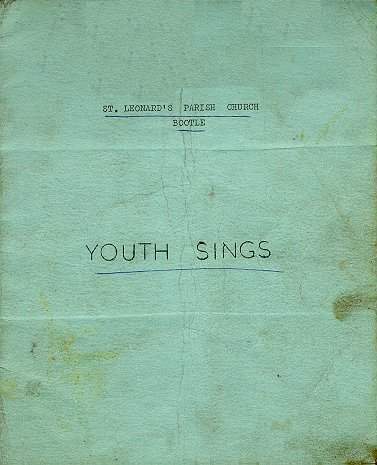 If you have arrived at this web page after searching for the words/music for a song, then you will need to move down to the lower part of this rather long page where the words of all the songs in the 1960s youth songbook of St Leonard's Church Bootle are. There is also a list of the 'sources' of the music for each song. To find the song without searching though all of them, simpy press Ctrl-F then type in a few words and enter/return. The sources of music for the songs are given at the end of the song listing. Otherwise, this page describes the kind of youth music which was sung at St Leonard's Church, Bootle in the early 1960s. Besides "Hymns of Faith" (in church), most of the late 50s and early 60s singing at St Leonard's was from the CSSM chorus book and "Golden Bells". The Mission to Bootle in 1959 (?) used the booklet "Songs of Faith" (edited by Tom B Rees). Later, the Billy Graham Crusade of 1961 (Maine Road, Manchester) brought in the book "Crusade Songs". 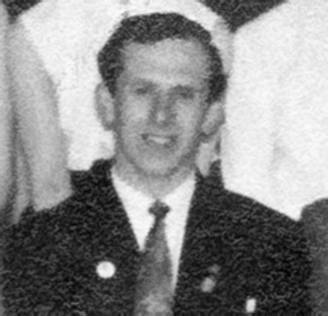 Tom Cooper Tom Cooper, organist, choirmaster and layreader at St Leonard's Bootle in the early 60s, was probably the most important Christian music influence on the crossBeaTs. Tom introduced what was then "modern" music into church, and added quality arrangements and imaginative chord sequences. His main sources of music for young people in church seems to have been the 20th Century Hymns of Geoffrey Beaumont and Patrick Appleford etc (published by Josef Weinberger). Tom also used American books of gospel songs published by "Singspiration" such as "Favourites" (there were many volumes of these) to introduce less formal songs for youth gatherings. Tom was a particular devotee of the music of John W Peterson (to the extent that his son was later named 'John Peter'). 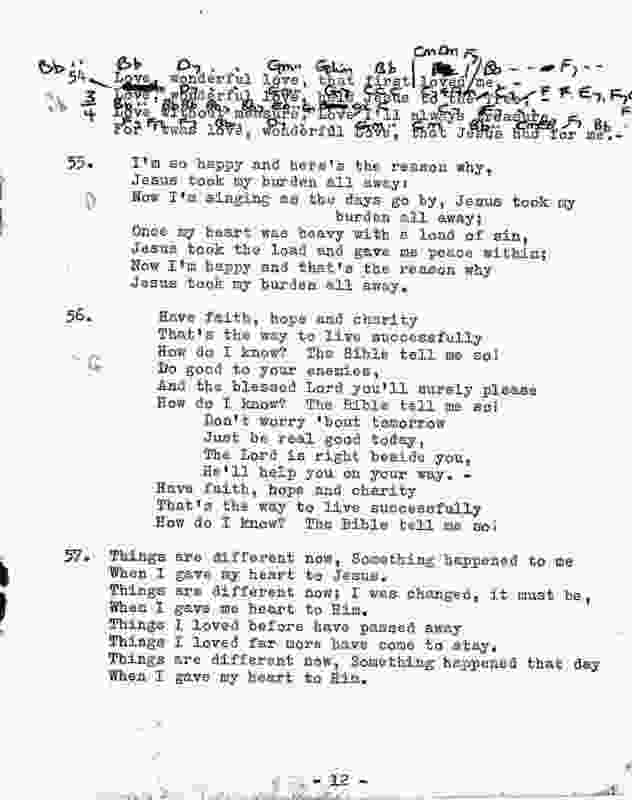 In the early 1960s, Tom created a youth songbook with all the "latest" Christian songs called "Youth Sings" - for the young people of St Leonard's. The illustration below shows the cover and one page of the songbook. Tom's influence can be seen in the chords for guitarists which he suggested, and which are scribbled in for one of the songs. The rest of this web page (below the illustration) shows the text of the complete songbook in the form of double-page spreads as they appeared. At the end of this is the list of 'sources' of the music for each song. Tom encouraged the crossBeaTs by supplying superb arragements to traditional hymns, and also pointing them to other "modern" sources such as "Western Style Songs" published by "Singspiration". Many of the early crossBeaTs songs were taken from these books before the group started writing their own. Tom and others were particularly helpful and supportive in the very early days of the group. Tom played Hammond organ on a couple of songs on the LP of 1967. He later married Dot Kirwin and they did a work for God in Norris Green Liverpool where in 1978 Tom was made Director of Evangelism and Minister of Music. In 1983, Tom was ordained and became the Minister of Lightbowne Evangelical Church, Moston - an independent Anglican church dating back to 1899. Tom retired to Burscough, Ormskirk in 2002, where he currently has an evangelistic and Bible teaching ministry to churches of a variety of denominations on Merseyside, Greater Manchester, as well as West Lancashire. The Cover Page of "Youth Sings"
(2) What a wonderful redemption! In His name I shall prevail. Every day as I go my way, it is Christ for me. For vict'ry o'er their foes. To the vict'ry you must win. And gives me joy and vic-to-ry. A glad and joyous harmony. Ever singing whether gaining or in loss. He can make the saddest heart to -- harmonise. Ever singing out the message of the Cross. Hearts are lonely and drear. (2) Cast your care on Jesus today. Leave your worry and fear. This is why I want to go. Lifted me up from sorrow and shame. Sing of a Saviour who came down from Glory . . . .
Coming to save sinful men. Sing it again and again. If you'll take my Jesus today. Looking to Jesus till glory doth shine. Moment by moment, O Lord I am Thine. Hour by hour, day by day, He is by my side . . . . This I know, for He tells me so in His book divine. And we'll keep on singing to the Lord. Let us keep on singing to the Lord. And He's my Saviour, this wonderful Lord. Safe am I, safe am I, in the hollow of His hand. Saved, saved to invite you to His salvation free? I'll be satisfied as long . . .
Now I'm singing a sweet song, so happy am I. Study to show thyself approved, Unto God, Unto God, Unto God. There's a wonder working power in the blood of Calvary. 34. Are you discouraged, burdened with a load of care? And you'll find your burden lighten as you kneel. Oh the joy He gave to me when He came and set me free! What a grand and wonderful day! Who but God's Son upon the Cross! (Believe it Thou) In heaven interceding! Here in my heart Lord, set up Thy throne. In royal fulness, reign evermore. Take me as I am Lord and make me all Thine own. Make my heart Thy palace and Thy royal throne. For LIFE begins when Jesus comes in. When Jesus said that whosoever will may come. Life is wonderful now to me. I let Jesus in, He changed everything! Oh, what a glorious message, and it's true. Yesterday, today, for ever, Jesus is the same. Glory to His name, Glory to His name! Though your sins as scarlet be, they shall be white as snow. Eyes have seen, ears have heard. Praises bring to the God in heaven adored. When we sing, let us sing unto the Lord. Trusting in Him who saves us, ne'er shall we suffer loss! At the call of the King of kings. Sing Hosannah to the King. Hasten to take Him your problems, for God answers prayer. For 'twas love, wonderful Love, that Jesus had for me. Jesus took my burden all away. How do I know? The Bible tell me so! He'll help you on your way. When I gave my heart to Jesus. When I gave me heart to Him. Things I loved far more have come to stay. When I gave my heart to Him. Someone slipped and fell - Was that someone you? What He's done for others He'll do for you. (2) There is no night, for in His light you'll never walk alone. Always feel at home wherever you may roam. He is sifting out the hearts of men before the judgement seat. O be swift my soul to answer Him! be jubilant, my feet! I'm following Jesus, each step of the way. For Jesus is leading each step of the way. Gone! Gone! Gone! Gone! Yes my sins are gone! Raise the standard high for the Lord. Onward, forward, shout aloud "Hosannah"
While with the lost, we labour and weep. To seek only Jesus's will. With our eyes on the guide all the time. Where shall its praises begin? (1) Were you there when they crucified my Lord? Were you there when they crucified my Lord. (2) Were you there when they nailed Him to the tree? (3) Were you there when they laid Him in the tomb? (4) Were you there when He rose up from the grave? Oh, sometimes I feel like shouting, "Glory, glory, glory!" When I think how He rose up from the grave. I asked the Lord to help me, and he showed me the way. Oh . . . .
And if I am a Christian, I am the least of all Oh . . . .
Thy power through out the universe displayed. Thou my soul's glory, joy and crown. Jesus is fairer, Jesus is purer. Than Thou my Saviour art to me. Had to walk it by himself. 9. Miracle Melodies. No. 1. 14. Christian songs. Album 4. 23. New Sacred Songs. No. 2. 27. Western Style. Vol. 1. 35. Christian Songs, Album 5. 37. New Sacred Songs. No. 1. 43. Christian Songs. Album. 4. 65. Western Style. No. 1. 68. Christian Songs, Album 2. 69. Western Style. No. 1.